I had been so busy working during the past year that I had not had any time to celebrate the many successes that Plated Public Relations acheived. I will be writing about a few of the projects I've worked on over the past year here! My vision for my business was to work with clients in the agriculture and food industries in Edmonton. There are so many local producers, farmers, vendors, food makers, restaurant owners and chefs who work tirelessly every day to put food on our plates. The diversity of the food scene here in Edmonton is amazing! You don't have to go far to find a new restaurant opening around the corner, or to find a homemade food vendor hawking their goods at a market. I love working with these hard-working folk because they have such a passion for what they create. Ron and Sheila Hamilton are no exception. Owners and operators of Sunworks Farms, they truly put their heart and soul into their delicious meat products. I interviewed Ron way back for a blog post on Parkallen Home Kitchen, and it was nice to re-connect with him at the Strathcona Farmers Market one Saturday afternoon. I told Ron about the business, and he told me about his vision for a food blogging tour and dinner. Over the next month, we planned the menu and day of events. On a beautiful June day, 30 food bloggers met at the farm to learn all about Sunworks operations. The group was very active on social media, and we were trending number 2 on twitter in Edmonton for a while. (Yay!) Here is my summary of the day's events. 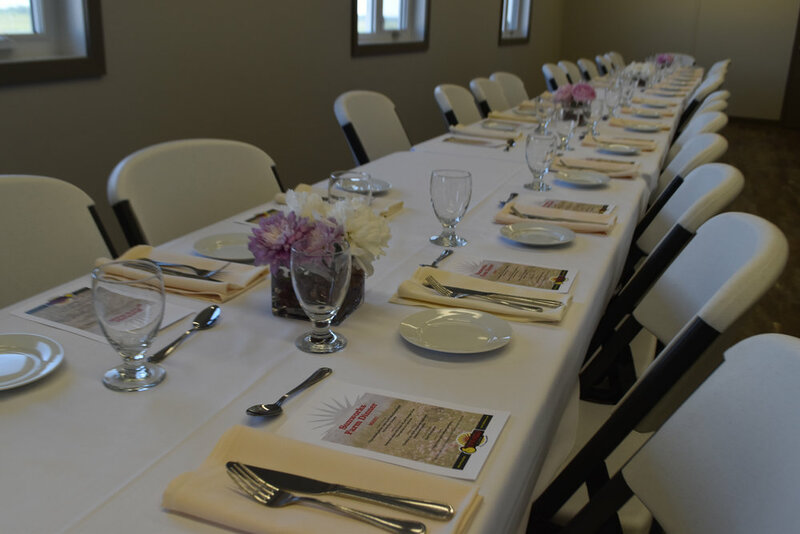 At the end of the tour, guests were treated to a gourmet meal prepared by Chef Kevin Zellweger from the Quarter Section Food Co. Each delectable course featured some of Sunworks Farm's products. Guests were sent home with a full bag of Sunworks chicken sausages to enjoy at home, again courtesy of their generous hosts. It was a spectacular day, and I was so fortunate to get to work with Ron and Sheila.